It’s been almost two months since Apple released the Messages beta, the revamped version of iChat slated to arrive with Mountain Lion this summer. And, thanks to a lack of subsequent updates, I and at least a few of my colleagues have jumped ship back to our pre-Messages IM clients. Those who haven’t, well, I’ve noticed they seem to spend a lot of time cursing at Messages. Message center: The Messages Beta was released in February, and hasn't been updated since. In the vein of our fearless leader Jason Snell’s recent point that Apple’s been long overloading iTunes, I think the company might want to reconsider the direction it’s heading in with Messages in Mountain Lion, in particular with the integration of iMessage. 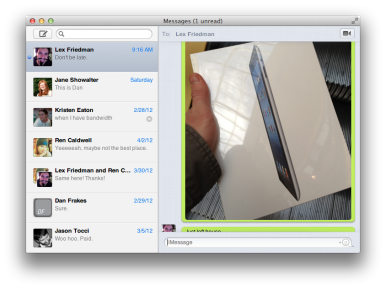 It’s not that I don’t want the ability to send and receive iMessages from my Mac. There’s an undeniable convenience to having a single way to reach me, no matter which device I’m using. But at the same time, I think that cramming that functionality into Messages is just slightly off—call it sticking a round peg into an oval-shaped hole. On the face of things, instant messaging and text messaging are technologies that seem pretty similar: They both involve sending text and images over a network to a conversation partner or partners. Then again, you could say the same thing about instant messaging and email, and I think many of us would look askance at having our email accounts folded into Messages—or, for that matter, iMessage incorporated into Mail. So why do iMessage and IM need to occupy the same space? Texting is an inherently permissive system, much as we might often wish it weren’t. Give someone your phone number and you’ve implicitly allowed them to send you text messages as well. And while it’s all too common to screen calls, there’s often no easy, standardized way to block someone from sending you text messages or revoke their ability to text you, short of the nuclear option of changing your phone number. Some carriers do allow you to block messages from specific numbers, but it usually isn’t managed from your phone itself, and, in the case of AT&T, it requires an additional fee. Block party: IM clients have long had granular permission controls. To compound matters, this permission grants people the ability to disrupt you no matter when or where you are—including now on your computer. The best you can do is control to whom you give your phone number, but even that’s no deterrent, as anybody who’s ever received a spam text message can attest. Even further, with iMessage, you’re available not just to anybody who knows your phone number, but also to any person (or, potentially, service) to whom you’ve given your Apple ID—which for many users is also their primary email address. Contrast that to instant messaging, which has long provided granular permissions. It’s easy to block users, limit access to just those on your buddy list, or even create a strict whitelist of the very few people you want to be able to send you instant messages. It’s also easy to create multiple usernames, if you really want to, say, keep a strict division between your work and personal lives. 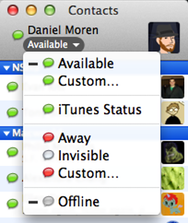 Status report: Instant messaging clients also let you choose how you show up to other users. Instant messaging is inherently a stateful system: You’re online, you’re away, you’re idle, you’re invisible, you’re offline. Most importantly, you get to dictate your status. For instance, I mark myself as away when I’m at lunch; sometimes—spoiler alert—I’m still at my desk; I just want to dissuade people from expecting a prompt reply. Sometimes I’m not at my desk at all, in which case IM functions more as an answering machine—messages for me to respond to at my discretion, when I have time. Text messaging, on the other hand, is stateless. You’re always available, whether your phone is off or on, or whether your phone is on your person or not. With that statelessness comes an expectation that you should always be available, because, well, you’re getting my messages, aren’t you? Aren’t you? This is more psychological than technological, but I’d wager most of us have obsessed over whether or not someone has actually received or read our text message—and, if so, why they haven’t responded. In fact, that’s one concern shared by teenagers sending messages to their crushes and parents sending messages to their kids alike. iMessage counteracts this slightly, with the addition of delivery and read receipts. Read receipts are optional, which does give us a little control over people knowing whether or not we’ve read their messages. But because the feature is optional, we might start to wonder why someone hasn’t read our message when it turns out that they actually just don’t have that feature enabled. But it still doesn’t nearly approach the kind of state capabilities that IM clients allow for. Online status is such a cornerstone of instant messaging as a service that it’s jarring in Messages to switch back and forth between conversations and change mental gears in terms of whether or not people are present in our conversations—even in the case of going between iMessage and IM conversations with the same person. Typically, I’m only logged into instant messaging on a single device. (Sometimes I log onto a second device, whether it be my MacBook Air, iPhone, or iPad, but it’s rare, and I usually try to log off the other device first.) The key point is that it’s up to me; I can choose which device I want to be associated with at any point in time. Triple threat: Seriously, how many times do I need to be sent the same message? It’s not quite the same with iMessage. On iOS devices, you’d have to navigate into Settings and flip iMessage off or on every single time. On your Mac you can at least disable your iMessage account in Messages. But Apple clearly intends for you to always be available for iMessages—case in point, Messages on the Mac will continue to receive messages even when it’s not open, displaying an unread count on its Dock icon. That also means that we get the same message on multiple devices—for me, up to four or five—at the same time, along with a cavalcade of alert sounds. At this point, you’re probably saying to yourself “OK, you’re so smart, what would you do?” I’m glad you asked—maybe not in such a snarky tone, but I’ll take what I can get. I’d suggest there’s already an app on OS X that fits more naturally with Messages: an app that supports live communications between multiple parties, is keyed to a phone number or an Apple ID, and provides a list of all your contacts, regardless of whether or not they actually use the service in question. Both apps are also refugees from iOS—heck, Messages on iOS already includes a FaceTime button at the top of every conversation. 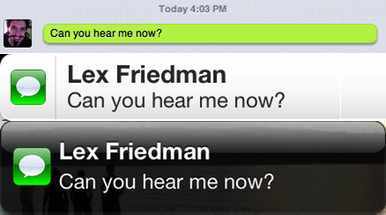 And, as my colleague Lex Friedman already noted in his early look at Messages, FaceTime integration with Messages is lackluster, to say the least. Plus, Messages was built on iChat, which already had its own video-chat capability, introducing a strange sort of redundancy. So why not two separate apps? Keep iChat the way it is, for instant messaging, and have a new FaceTime-iMessage combo. Call it FaceMessage—I don’t know, I’m not some sort of nameologist. For receiving iMessages, I’d love to see something akin to the excellent Growl Voice, a menu bar utility that uses the Growl notification framework to provide you with notifications of text messages sent to your Google Voice number, and provides a simple interface for reading and responding to them. An app aimed more at iMessages might even be able to provide some client-side options for controlling who you’ll receive messages from on your Mac. Another option would be to open up the iMessage protocol to other developers, letting them construct their own third-party clients for the Mac. Unfortunately, I don’t think that’s very likely, in part because Apple would then seem to be obligated to allow the same thing on iOS. The precedent’s not exactly optimistic either: Apple said way back when it introduced FaceTime that it would make the video chat protocol an open standard—feel free to give me a shout if you’ve run into any third-party FaceTime clients lately. If you’ve been paying careful attention—and I’m sure you have—you’ll have noticed a theme running through all of these points: control. For instant messaging, users are given a large degree of control. On the flipside, that also makes the software more complex, with a steeper learning curve; by comparison, text messaging is more or less drop-dead simple. But even a meager degree of control on top of iMessage would be a welcome addition. Maybe Apple will head that direction in the future—perhaps even the final version of Messages that ships with Mountain Lion will have improvements over what we’ve been shown so far. Personally, I would be happy to simply have iMessages available on my Mac without having to deal with the misbegotten chimera that is Messages.